This 2 bedroom, 1 bath cottage is located at the bottom of a 6 acre parcel in the middle of the forest. The master bedroom has a king size bed, the second room has a Queen bed and there is a trundle bed in the living room. The ceilings are open beam cedar, the floors are bamboo and stone and the cottage has many custom details. The bathroom has a large custom walk in shower. Outside there is a covered lanai with a nice table and seating as well as an outdoor soaking tub surrounded by flower gardens and forest. Bill is a licensed General Building Contractor, and I am a licensed Realtor in the state of Hawaii. We designed and built the houses on our property, and have decided to make this our final home. During our 20 years here we have lived in Waikoloa Village, moved to Kona and continued to move to higher elevations preferring the cool climate of the higher elevations. If it is your dream to live in Hawaii we can help make that a reality. Get a unique Hawaii experience. Wake to the sounds of birds, hike through the forest of Ohia, Koa and Hapu Ferns, and pick wild Lilikoi. Tucked into the fern forest, ideal for hiking, bird watching and photography. If you find the heat in town a bit much for you, this is the ideal location. The Big Island is known for it's world class fishing and active volcano. The cottage was well appointed, had a very usable kitchen with spices and condiments and there were beach stuff and coolers for use. We were only there for the weekend so didn't get to take advantage of the rentals available (kayak and SUP, I believe) through the owners. Beds were comfy and there was even a friendly cat who joined us now and then. I highly recommend this lovely spot in the jungle. The property was nice and seemed well cared for and was Very secluded & private and a long drive to get anywhere. So, if we went to the beach and got hot, salty and sandy, we had a long drive to get cleaned up and a long drive back into town to be able to go out to a nice dinner. If you plan on hanging out at the cabin and not seeing the island, this wouldn't be an issue, but we wanted to explore and see the sites. It was not as cool as we had hoped it would be. After a long hot day at the beach, I would have enjoyed some air conditioning. As it was, we purchased a fan, because the overhead fans just didn't do the job. By morning, it felt cool, but to be able to sleep, we needed it to be cooler. Also, it was odd that there was only one hand towel for an entire weeks use, and one bath towel per person and not one wash cloth. We requested some, and received them, but it seemed strange that we had to ask for such a basic necessity. Also, there weren't enough dishes. We only had 4 plates, so we never had enough for a dishwasher full and ended up having to wash by hand. I'm not sure what would happen if there were more than two people staying here, because it looks like it sleeps 6 people. The outdoor bathtub was nice, but be prepared with bug spray, because they come out pretty thick at night. Daytime is a little better. Overall, it was nice, but I wouldn't stay here again. I’m sorry you were not happy with your stay. If you had asked I would have been happy to bring you a fan. You are the first guest to comment on being too warm. What a wonderful place to get away from the crush of tourists and sweltering heat in Kona. We loved returning to this oasis of quiet and cool after the day's activities. The cottage is surrounded by dense vegetation--very private. Everything we needed for our stay was provided except food of course. Having said that, we loved the bananas the owner brought to us--apple bananas--delicious! She was quick to respond to queries while at the same time respecting our privacy. We felt right at home and hated leaving at the end of our stay. Ollie the cat was a bonus! How nice to have a fur person to welcome us/and we him each day. We highly recommend the cottage for any length of stay. Great property with GREAT Hawaiian vibe!! NO complaints here. This is a great property with GREAT Hawaiian vibe. Neat and clean. One small mechanical glitch was quickly attended to by the owners that live close by. (Thank you!). Our only suggestion would be one more chair in the dining area and another chair on the lanai. There were only two at both locations and there were 3 of us. Plans are to return to the Big Island next year and will definitely stay here again!! Fantastic place to stay near Kona! This is a great little property set higher in the hills where it is actually cool enough to sleep. The cottage is amazing with open beam cedar ceilings and lovely tile. This cottage was built with love. Very quiet and secure. Absolutely a must if you are looking for a place to stay on the Kona side of the island. Beautifully hand crafted home in the jungle with lots of privacy and star gazing. The house had all the required amenities plus beach supplies. 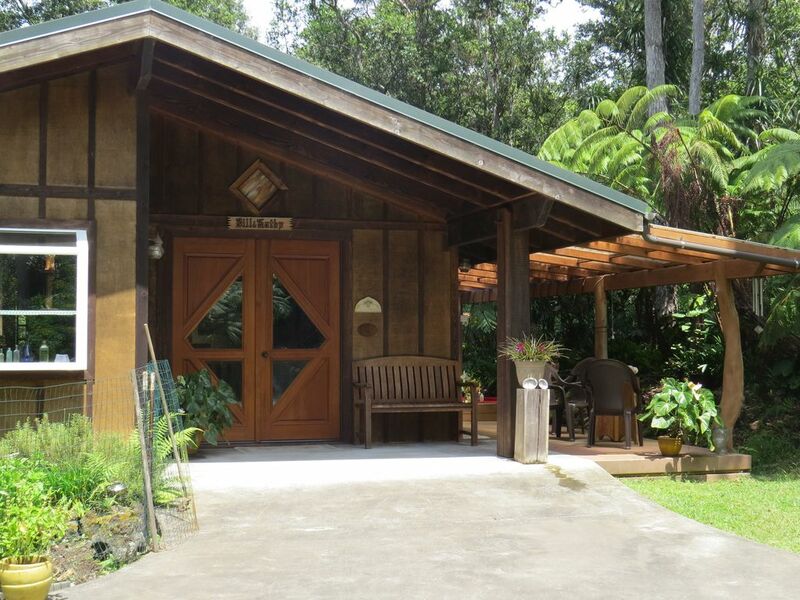 I plan to recommend this house to all of my friends who come to the big island. The cat Ollie makes sure everyone is awake around coffee time than heads off agin, he’s legit. Quality experience overall.